Made for all your aches and pains. Maybe it's a sore feet from work, a hard work out or maybe an old injury, all will benefit from a good massage. This product was initally made for Angie's old whip lash injury but has been used by people for everything from RSI to arthritis. 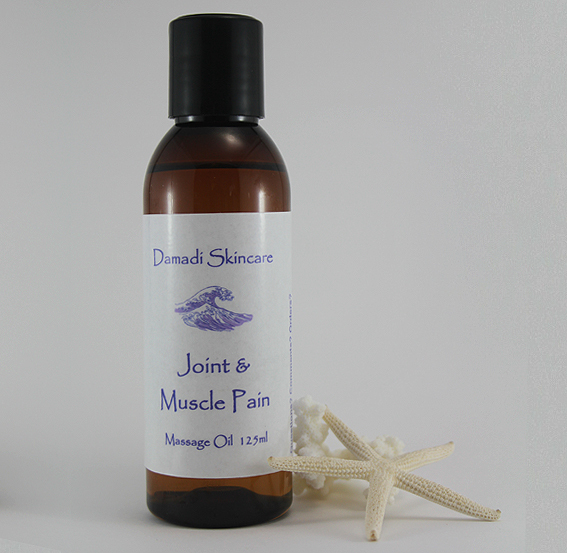 Joint & Muscle Pain oil is in a Macadamia oil base and smells of delicious ginger and warm pepper. Application - rub deeply into the affected area or better yet, ask a kind friend to do it for you. Tip - If you are a couple and intend massaging each other, do it on alternative days. The first person is in a really relaxed cosy mindset after being massaged and will unintentionally do a half hearted effort on the other person. So make Monday her day and Tuesday his day etc... this is a relationship saver! Tip - Many people with old injury's benefit from taking Omega 3 Fish oils. Please dont use Krill oil, I know its better than standard fish oils but lets leave the whales something to eat.